My new book Siddhartha’s Brain was published as a paperback in the UK on Thursday. The book is all about what meditation and mindfulness do to your brain, what it might mean to be “enlightened”, and why mindfulness-based therapies have been showing such promise as treatments for anxiety, depression and addiction. I also explore the mystery of why human beings are so prone to mental illness. A potential answer may be found on the African savannah millions of years ago during the slow evolution of our ancestors into the most highly sociable apes on the planet. Ed Halliwell – a former editor at FHM magazine and now a renowned mindfulness instructor – has suffered from debilitating bouts of anxiety and depression for much of his adult life. Published in the UK on the same day as Siddhartha’s Brain, Into the Heart of Mindfulness provides moving, first-hand testimony of how mindfulness can help people with mental illness get their lives back on track – and provides a perfect complement to my own book. The story of the spiritual journey of Siddhartha Gautama, from spoilt prince to perfectly enlightened Buddha, is my backdrop – though it goes without saying you don’t have to be a Buddhist to practise mindfulness and improve your own wellbeing. All you need is a standard-issue human brain and a little dedication. If you’re interested, read the extract published in last weekend’s Observer Magazine, find out more about my motivation for writing the book on a recent blogpost to mark its publication in the US, or listen to a short extract from the audiobook, read by the wonderful Steven Crossley. If you’ve already read Siddhartha’s Brain or are reading it I’d love to know what you think. I can usually be found hanging out on Twitter @JamesAKingsland. Reblogged this on The Pursuit of Authenticity. I just finished reading your book Siddhartha’s Brain…this book is brilliant! To explore the scientific and psychological data of mindfulness meditation and Buddhism captivated me throughout the book. It’s very well written and easy for a lay person to follow. 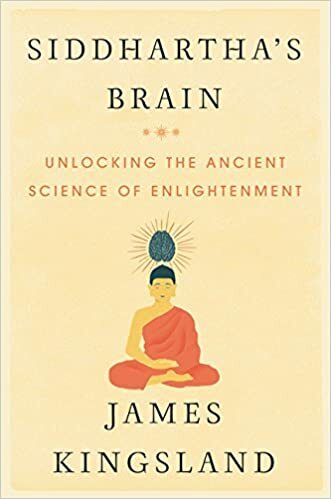 I just read this book and am most impressed by the elegant concept and writing and the very helpful and inspiring explanations of the ways in which mindfulness and Buddhism converge with new findings in psychology and neuroscience. I feel I have a better relationship with my brain as a result of your enlightening presentation! Thank you. I’m so glad you enjoyed the book and got something worthwhile out of it! Take care. I’m glad I encountered your book. I am recommending it to several friends who have expressed interest in Buddhism and meditation but can’t quite jump all the way in, to the degree that I have (in the sense of being committed long-time trainee in Soto Zen Practice); yet are looking for their own “middle path”. Your book and stance are a terrific offering to those that are exploring. As an aside, I would like to mention a thought that I have found to be very helpful in regard to the difficulty that seems inherent in the word “religion”. I found that the word’s latin roots essentially means to re-connect or to re-bind. So, I combined that with the “empty feeling inside” that people often speak of when in various recovery modes from addiction, trauma etc: So, when I think in terms of trying to find a way to reconnect to that which I feel dis-connected from, and not know what it is, yet must find a way to It; that is the heart of the mystical approach to pain, alienation, confusion, and various unspecific yearnings. Anyway, Thank you for your offering. Hi Helmut, thanks so much for your kind comment. I began the book in a spirit of sceptical enquiry before making any kind of deep commitment, so I’m really glad you think it could be useful for others who aren’t yet ready to “jump all the way in”. Regarding religion and spirituality, I think the need to find meaning and connection in life is too often disregarded now by people in the west, as if social and professional status, a constant stream of pleasant distractions and a fat wallet were enough. As you say, the end result is often addiction and a sense of alienation and emptiness. Family and friends, community, can provide a sense of purpose and connection but so can religion. I’m not a believer myself these days but I do think it’s a shame that it has become fashionable in some circles to view religion with disdain or even contempt. « Do psychedelics qualify as a new class of antidepressant?